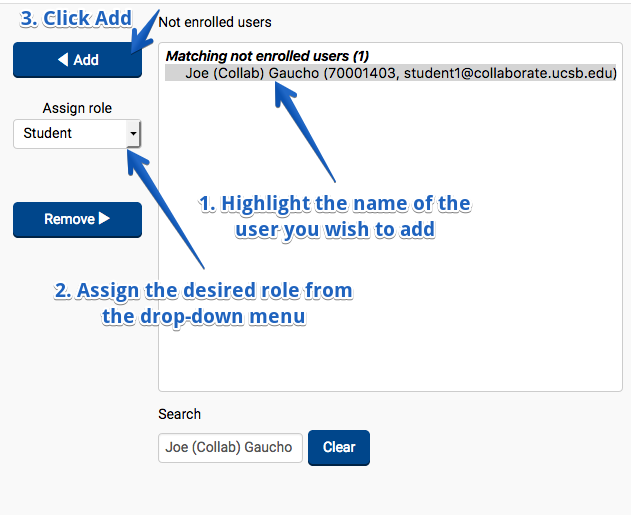 GauchoSpace automatically adds Teaching Assistant(s) to your course site once they are officially listed in STAR/GOLD by your department. 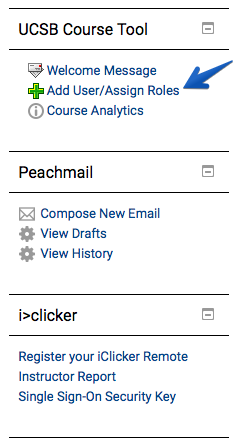 If your TA has not been listed yet but they need access to your course site, you can manually add them to your course site. This Help Center article explains how to manually add a TA to your course site and how to change a Non-editing TA into an Editing TA. Note: You can check to see if your TA(s) have already been added to your course site or check the role assigned to your TAs by clicking on Users>Enrolled Users in the Administration block. 4. 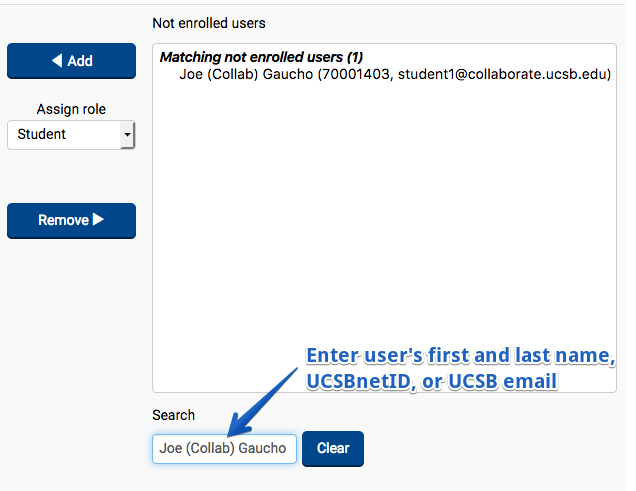 In the search box on the bottom right, enter the TA's first and last name, UCSBnetID, or UCSB email. *Note: Most Teaching Assistants will have a .ucsb.edu address as their primary email. 6. Choose the user's appropriate role from the drop-down menu in the center (Editing TA or Non-Editing TA). For more information on these participant roles, see the help page about participant roles in GauchoSpace. 7. Click "Add" to add the participant. If your Teaching Assistant has been automatically added into your course site, they will be given a Non-Editing TA role. If you want to promote their role to an Editing TA, follow the steps below. For more information on participant roles, see this help page about participant roles in GauchoSpace. 3. Below the text box, select Promote TA to Editing TA. 4. On the next page, check the box next to any TAs whom you would like to make Editing TAs. Click Save changes.